Happy Friday!! Sorry, I've been a little MIA this week with no posts. I feel like I have so much going on, but nothing going on all at the same time. It's been a good week overall, so that's always positive. I'm linking up with Darci for 5 on Friday to share 5 little tidbits about my week. I've failed to blog about or mention that I've been getting my house cleaned for about the last month or so. They come every other Wednesday and it's glorious!! Seriously, it's such an anxiety reliever for me to know that it's all done and I don't have to worry about it. Plus, I love that it leaves me more time in the evenings with Hailey and on weekends with Wayne. Our time together as a family is VERY limited, so I like that fact that I don't have to use our family time away to be cleaning. Wayne's recovery is going well. He's been sleeping in the recliner in the basement since he's been home last Wednesday night. I think he's finally ready to come back to bed though. You can really only sleep in a chair for so long, even if you are recovering from surgery. Although, I've enjoyed having our whole king size bed to myself, I miss him terribly. SO excited about Fall TV starting this week. I have a post coming on that this weekend. The new iPhone is out today! Woohoo! I downloaded the new ios7 late Wednesday night, so I've just been able to play around with it yesterday, but I have to say I really like it. Basically they are trying to compete with android and windows phones, so I totally get why all the new features are the way they are. I am due for a phone upgrade, but Wayne is not yet and I think we might switch to the Verizon network at that point. He gets a deal through his work and he's been SO not happy lately with our Sprint service. So we'll see. 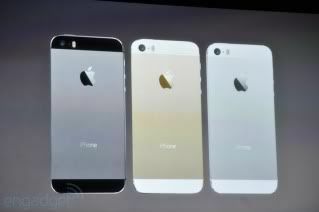 Either way, we WILL be getting the newest iPhone 5s. 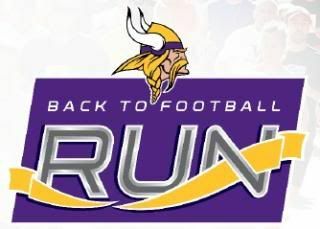 Last but not least, we are doing the Vikings 5k tomorrow morning. We have to get up a lot earlier than we normally do and get downtown by 7:30 am which is race start time. Totally sucky and it kind of snuck up on me. I haven't been to the gym or been working out since I sprained my ankle about 5 weeks ago. We are walking/running it with Hailey in the jogging stroller. It should be fun, it's just SO freaking early! How was your week? Anything fun planned this weekend? Sounds like it's been a pretty good week. Good luck with your 5k! I am doing one on Sunday and realized I am not ready to run much of it either! So I feel ya! You will have fun though, and that's what matters.